We’d love your help. Let us know what’s wrong with this preview of The Little Red Hen by Diane Muldrow. Beloved illustrator J. P. Miller's graphic, colorful farm animals seem to jump right off the page--but they aren't jumping to help the Little Red Hen plant her wheat! Young children will learn a valuable lesson about teamwork from this funny, favorite folktale. To ask other readers questions about The Little Red Hen, please sign up. How can Diane Muldrow put her name on the story from 'way before her time? Could just anyone rewrite a classic, drop a preposition on each page and call it a new book? I'm truly curious. Another great story which I had heard before but didn't know the name. Now I have properly read it. I loved the story a lot. It is soo beautifully written. You are probably familiar with the idea I think. Every day the Little Red Hen collects worms for her children to feed. One day she accidentally finds a seed of wheat during her search for worms. She doesn't know what it is but she finds out that it is a seed of wheat and can be grown into a wheat and can be made into bread a Another great story which I had heard before but didn't know the name. Now I have properly read it. Every day the Little Red Hen collects worms for her children to feed. One day she accidentally finds a seed of wheat during her search for worms. She doesn't know what it is but she finds out that it is a seed of wheat and can be grown into a wheat and can be made into bread after. On the barnyard where she lives, lives a Rat, a Pig and a Cat also. They have no responsibilities and waste their time all the day. While Red Hen has to feed her children. Red Hen wants to grow the wheat. She asks her neighbours to help. But they are too lazy to help and prefer to sleep or waste time. So she do this all on her own. It is difficult for her to manage because of her children's responsibility but she manages to grow the wheat and makes the bread out of it. Now everybody on barnyard is ready to eat it. But whenever she asked everyone to help in growing the wheat or cutting the wheat or making the bread nobody was ready to help. So in the end she eats the whole bread alone. I think this story relates to our society. We want everything without hard work. Overall the story is great, moral is great. Loved it! I read this book as a child and have remembered it since due to the simple yet powerful message it portrays. The tale is set in a farmyard and is based on a hen and the other farmyard animals which surround her. One day the little red hen finds a grain of wheat and asks the other farmyard animals to help her with the various processes involved in growing it like the planting, harvesting and threshing of the grain and then the milling the wheat into flour and baking of the flour into bread. Howev I read this book as a child and have remembered it since due to the simple yet powerful message it portrays. The tale is set in a farmyard and is based on a hen and the other farmyard animals which surround her. One day the little red hen finds a grain of wheat and asks the other farmyard animals to help her with the various processes involved in growing it like the planting, harvesting and threshing of the grain and then the milling the wheat into flour and baking of the flour into bread. However each time she asks one of the animals for some help with the process they decline and the little hen receives no assistance. Eventually the little red hen sees the product of her process complete in that the bread is freshly baked and ready to eat. 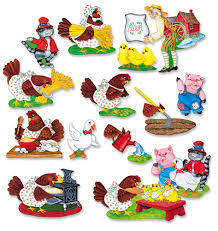 The little red hen then asks the other farmyard animals who will help her to eat her bread and all the previous non-participants volunteer. The little red hen declines their help in this task and eats it with her chicks leaving none for anyone else. This story shows the hen teaching the other animals a lesson in that its moral is that those who show no willingness to contribute to a product do not deserve to enjoy the product. Hilarious. Borrowed it from my little nephew. Still enjoy it after lo those many years ago from my childhood. The Little Red Hen finds some wheat seeds while searching in the fields. She decided to plant the seeds in order to make some bread for her farmyard friends. She needed help with the task involved in making the bread. She asked her friends “who will help me plant the seeds, who will help me cut down the wheat, who will help me grind the wheat and who will help me make the bread”. The Duck, Cat and Dog all said “not I” so the little Red Hen did all the work. When the bread was done and the animal The Little Red Hen finds some wheat seeds while searching in the fields. She decided to plant the seeds in order to make some bread for her farmyard friends. She needed help with the task involved in making the bread. She asked her friends “who will help me plant the seeds, who will help me cut down the wheat, who will help me grind the wheat and who will help me make the bread”. The Duck, Cat and Dog all said “not I” so the little Red Hen did all the work. When the bread was done and the animals smelt the appetizing aroma she finally said, “Who will eat the bread, I will” shouted her friends “I will” said the little Red Hen and so she did. I first read this story as part of a farming topic to my year 2 class. It teaches a very important lesson, that you cannot benefit when you have not contributed to the labor. The famous saying applies “you reap what you sow”. This book is best suited for early years and key stage one. The little Red Hen is an excellent book for children interaction. There are various animal characters the children could act out. The continuous repetition makes it easy for them to follow and participate. This book can also be used as a literacy lesson as part of creative writing task. The children will be encouraged to use more adventurous verbs and adjectives. They could create their own characters and recreate this famous story. For example, instead of writing “not I “said the duck. They could say “not I” bellowed the ferocious dragon. It will be interesting to see the ideas and characters they come up with. This task will help them to use their imagination as well as increase their vocabulary. The aim is to get them into the practice of using more interesting vocabulary in their work. The Little Red Hen tells the tale of a hen who lives with a pig, duck and a cat. The hen does most of the work around the house as the other animals are very lazy. During the story, the hen decides to make a loaf of bread. At each stage of the bread-making process, she requests help from the other animals. Each animal refuses to help throughout the whole process as they are too busy doing what they enjoy doing, leaving then hen to do all of the work. Once the loaf is ready, the animals all want t The Little Red Hen tells the tale of a hen who lives with a pig, duck and a cat. The hen does most of the work around the house as the other animals are very lazy. During the story, the hen decides to make a loaf of bread. At each stage of the bread-making process, she requests help from the other animals. Each animal refuses to help throughout the whole process as they are too busy doing what they enjoy doing, leaving then hen to do all of the work. Once the loaf is ready, the animals all want to eat it but because they didn't help to make it, Hen doesn't let them. I really was not a fan of this Golden Book when I was growing up. This is a nice book, that is good for reading with a friend. This book was far more moralistic than I remember it being as a kid. Still a wonderful and enduring children's book. I remember hearing this fairy tale as a child and it still sends a valuable message today. The Little red hen picks up a grain of wheat and while the pig, the duck and the cat don't see its value, the hen asks who will plant it? They all answer "not I." and she plants the grain of wheat, tends it and harvests it, all the while the pig, cat and duck say "not I" and want nothing to do with any of the work. The Hen bakes bread with the wheat she has harvested and the pig, cat and duck smell it and I remember hearing this fairy tale as a child and it still sends a valuable message today. The Little red hen picks up a grain of wheat and while the pig, the duck and the cat don't see its value, the hen asks who will plant it? They all answer "not I." and she plants the grain of wheat, tends it and harvests it, all the while the pig, cat and duck say "not I" and want nothing to do with any of the work. The Hen bakes bread with the wheat she has harvested and the pig, cat and duck smell it and when the hen asks "Who will eat the bread?" they all come running saying " I will!" since they did not want to help plant it, tend it ,harvest it or bake it the hen tells them all no and eats it all herself. I loved this story and I really enjoyed reading it. I like how the Red Hen gave several chances for her friends to help her but they refused. I do not like how the Duck, the Goose, the Cat, and the Big did not help the Red Hen to plant the grain of wheat, reap it, carry it, and dough, but when was the time to eat it, they came. Read aloud for children from K to three years old. It helps them learn about types of animals like Duck, Goose, Cat, and the Big. Also, they will learn how to plant wheat and make bread from it, and what materials they need to plant it. Children on second and third grades will read it by themselves. They will able to learn that people should help each other, and nothing come easily without working hard on it. The language is simple and there are lots of words repeating like “ Not I, and who will help me.” The illustrations are beautiful, and the way that characters dressed. This was the first LIttle Golden Book I bought for my now five-year-old son. One of the reasons I bought it because I remembered using it for a story time at the library. Of all the versions of The Little Red Hen, this one really shows how much work the hen did between the finding of the grain of wheat and the eating of the bread. Even my son understands the injustice of the hen doing all the work, and the other animals expecting to eat the bread. The other reason I bought it was for the delight This was the first LIttle Golden Book I bought for my now five-year-old son. One of the reasons I bought it because I remembered using it for a story time at the library. Of all the versions of The Little Red Hen, this one really shows how much work the hen did between the finding of the grain of wheat and the eating of the bread. Even my son understands the injustice of the hen doing all the work, and the other animals expecting to eat the bread. The other reason I bought it was for the delightfully timeless illustrations. My son read a readers' theater version as his homework tonight and it is a great story for young readers to practice reading with expression. And of course, the ending always causes some giggles but the message is so true...you can't expect to get anything good if you don't put in the work to make the good thing happen. A classic capitalist fable, only slightly altered from the original. Too bad my daughter doesn't seem to understand why the hen is "being mean" and "not sharing." However, this has remained one of her most requested stories for a year, and she loves to say all of the "Not I" parts, and she is slowly starting to get the point. This is a good book because it teaches that if you want something, you should always help to get it. Participation is key in life and children will learn this while they read this book. 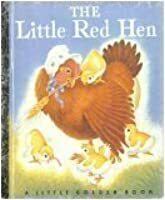 The Little Red Hen is a folklore book for children ages three to seven years old. It won the 2006 New Yrok Times 10 best Illustrated books of the year and ALA Notable children book. 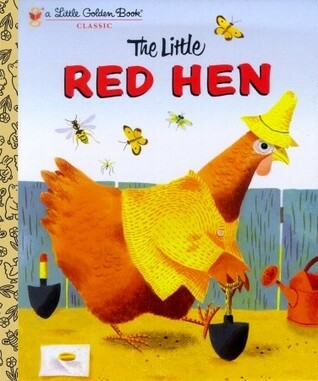 Summary: The story tells of the little red hen demonstrating hard work and strength to get what she wants. Through her hard work she asks from some assistance from her friends but in the end her friends show who they really are. Evaluation: The plot of The Little Ren Hen is important because it teaches the lesson of The Little Red Hen is a folklore book for children ages three to seven years old. It won the 2006 New Yrok Times 10 best Illustrated books of the year and ALA Notable children book. Summary- The little red hen is a hard worker who asked for help making bread but never receives it from the other animals. These animals are lazy and seem to have better things to do than help the little red hen so she doesn't give up she keeps working all alone. But when it is time to eat the bread all the animals want to help her eat it but she explains that "Who will help me plant the seeds, who will help me cut down the wheat, who will help me grind the wheat and who will help me make the bread" and they all said "Not I" so she explained it was all her hard work so she ate the bread all by herself. Review- I really think this is a great book that teaches children that they will get what they put into things. If they are lazy and don't do the work they won't get any benefits. Like the little red hen, she worked so hard to make the bread but she also got to enjoy the bread. Children who work hard will also reap those benefits. It's a very motivational book. 1. Teamwork is important as seen in this book. The Little red hen did everything herself and didn't get help from any of the other animals. A teacher could use this to build the classroom community and promote teamwork. This book demonstrates the importance of teamwork. I have never heard of this book before, but I really enjoyed reading it. I thought the book was very colorful and I liked how there were multiple characters within the book. Each character in the book was related to a farm animal on the farm. I think that the book told a good story and had an easy life lesson to understand. The book had a lot of repetition and I think it would be easy for kids to keep up on and stay interacted. If little kids were reading or listening to the book, I think they w I have never heard of this book before, but I really enjoyed reading it. I thought the book was very colorful and I liked how there were multiple characters within the book. Each character in the book was related to a farm animal on the farm. I think that the book told a good story and had an easy life lesson to understand. The book had a lot of repetition and I think it would be easy for kids to keep up on and stay interacted. If little kids were reading or listening to the book, I think they would be able to take away the lesson. I was able to tell the book was a fable by the end of reading. While reading, I was a little unsure if the book was a fable but at the end I was definitely sure. Based off of our class reading, I understand that a fable is a story that has a moral or lesson. I thought that this book did a good job of showing team work. The Hen in the book keeps asking the other farm animals if they will help with the farming and they keep saying no, and then at the end the hen makes bread and doesn't let the other farm animals eat it. I think the book shows that others can't benefit if they are not willing to help, and that team work is better in the end. The Little Red Hen by Diane Mildrow is under the genre children’s literature as a picture book and folk tale. The intended audience for this book is ages two to five years of age. The story is about a Red Hen who finds a grain of wheat and decides to plant it. She goes around asking each one of her friends to help her, and each friend refuses. I rated The Little Red Hen five stars because not only does this book teach a great life lesson, the use of language and illustrations are appropriate for The Little Red Hen by Diane Mildrow is under the genre children’s literature as a picture book and folk tale. The intended audience for this book is ages two to five years of age. The story is about a Red Hen who finds a grain of wheat and decides to plant it. She goes around asking each one of her friends to help her, and each friend refuses. 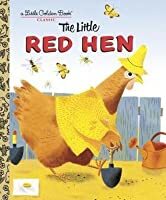 I rated The Little Red Hen five stars because not only does this book teach a great life lesson, the use of language and illustrations are appropriate for the intended age group. The dramatic plot seems unnoticeable as the Red Hen goes around asking her friends to help – all whom refuse, but as you move throughout the story and no friend agrees to help a conflict appears. When reading this book to a group of four year olds, the questions, “How do you think Hen feel, none of her friends want to help her plant the wheat?” “How would you feel?” were asked. The old folktale “The Little Red Hen” serves at as a great teaching tool. It is about an ambitious little, red hen who wants to grow wheat and asks her friends to help her. “Not I,” said all her friends. Finally, it is time to bake the bread from which she grew the wheat and milled the flour. Her friends still do not wish to help. Now it is time to eat and enjoy the bread and wouldn’t you know, her friends do wish to help. The little red hen replies, “no, no I will do that.” And she did. Children The old folktale “The Little Red Hen” serves at as a great teaching tool. It is about an ambitious little, red hen who wants to grow wheat and asks her friends to help her. “Not I,” said all her friends. Finally, it is time to bake the bread from which she grew the wheat and milled the flour. Her friends still do not wish to help. Now it is time to eat and enjoy the bread and wouldn’t you know, her friends do wish to help. The little red hen replies, “no, no I will do that.” And she did. Children love this story being read to them especially when you do all the different voices to the animals. Also, asking this children if they can see a pattern and what they think the next animals is going to say. You could use the moral of this book in a pshe lesson with key stage one on the importance of team work and how it is much easier when we help one another. The Little Red Hen is by Diane Muldrow, the story talks about a Little Red Hen who finds some wheat seeds. She then goes on to plant the seeds to make bread for her farmyard friends. She needed help with the task involved in making the bread, but nobody would help her. When the bread was done and the animals could smell it. They wanted to have some of the bread, but the Little Red Hen said no. This book is a great way to have children learn about helping others, farming, and it is a good read. Th The Little Red Hen is by Diane Muldrow, the story talks about a Little Red Hen who finds some wheat seeds. She then goes on to plant the seeds to make bread for her farmyard friends. She needed help with the task involved in making the bread, but nobody would help her. When the bread was done and the animals could smell it. They wanted to have some of the bread, but the Little Red Hen said no. This is a folklore. The Little Red Hen is a golden book. It is for children 4+. The little red hen wanted help to plant her wheat, carry the wheat, make the dough, bake the bread, and eat the bread. No one wanted to help but everyone wanted to eat the bread once it was finished. This book will teach children about teamwork and helping each other. I like this book because it can help teach a valuable lesson and I really like the illustrations. It is a cute, silly story. I think it will be appealin This is a folklore. The Little Red Hen is a golden book. It is for children 4+. The little red hen wanted help to plant her wheat, carry the wheat, make the dough, bake the bread, and eat the bread. 3. Original Summary- The little red hen needs help planting her wheat from one of the animals. When none of her friends want to help her she has to do it all herself. But she also gets the prize at the end while no one else does. 4. Original review- This text is great at teaching the lesson of team work and how important helping your friends really is. Great way of getting the classroom to help each other as a whole. Diane Muldrow grew up in Pittsburgh, Pennsylvania. She later attended Ohio University, where she earned a Bachelor's Degree in Magazine Journalism and a Bachelor's Degree in Fine Arts: Dance. After her graduation, Diane moved to New York. She spent several years performing as an actress and dancer in New York’s downtown avant-garde performance scene. She also danced in a performance at Lincoln Cen Diane Muldrow grew up in Pittsburgh, Pennsylvania. She later attended Ohio University, where she earned a Bachelor's Degree in Magazine Journalism and a Bachelor's Degree in Fine Arts: Dance. After her graduation, Diane moved to New York. She spent several years performing as an actress and dancer in New York’s downtown avant-garde performance scene. She also danced in a performance at Lincoln Center’s Alice Tully Hall and had her own one-woman shows. Diane has also had a successful career in publishing, both as an editor and as an author. She has written over 100 books for children. Diane lives in Brooklyn, New York, where she enjoys trying new recipes and eating in local restaurants.